Published on June 23, 2010 in General. 0 Comments Tags: art, assets, blender, CG Textures, content pack, frogames, Google 3D Warehouse, Lost Garden, OpenGameArt, resources, Serendipity, sketchup, SpriteLib GPL, top5. After the positive response we received for our Releasing a Game page, we decided to add an Art Assets for Game Developers page to our Resources section. 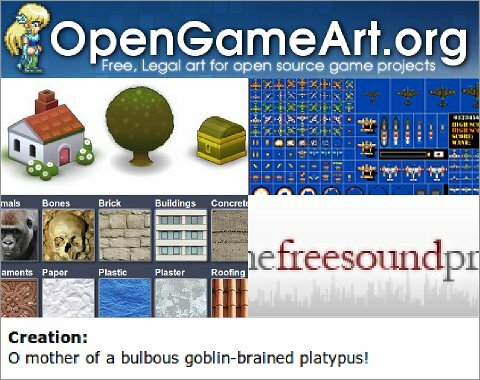 OpenGameArt.org: Inspiring concept. Although, still in its early stages. Lost Garden free game graphics and SpriteLib GPL: We couldn’t decide between these two new-school and old-school sprite sets. CG Textures: An abundance of textures suitable for 3D models. The Freesound Project: A huge list of Creative Commons sound samples. Serendipity: Random text generators, including the (G-rated) cuss-o-matic. Official Blender Model Repository and Google 3D Warehouse: Each is a mixed bag, but offers a large collection. Blender and SketchUp only though. CMU Graphics Lab Motion Capture Database: A huge mocap library. Unfortunately, probably not easy to use for many developers. Commercial content packs from frogames. Neat-looking drop-in solutions for Unity3D developers. Reasonably priced, but not free! We hope that you find the full list on our NEW Art Assets for Game Developers page handy! Be sure to bookmark it and post some comments.